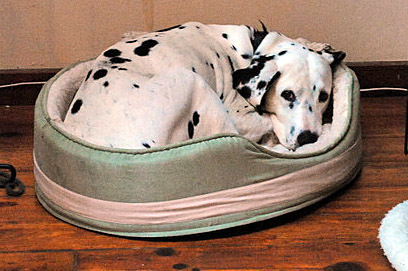 Mom, I love the new bed you gave me… It feels so cozy…. but, do I really have to share it with him? Jack Russell Terrier: a dog that won’t take “NO” as an answer. Love those pictures! How is Pits? And what happened next? 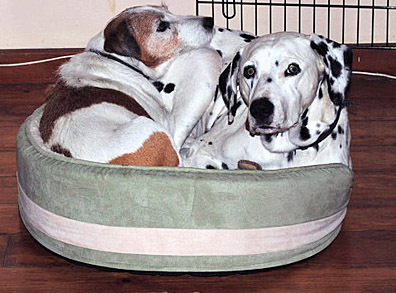 Very smart looking bed – no wonder they both wanted to be in there. Lovely dogs! @Doreen: Pits is doing much better since last week, so we are cautiously optimistic. Of course, at his age, one never knows. But he is fine for now. Thanks for asking…. I think I now understand the meaning of “dog pile” LOL. Too cute!